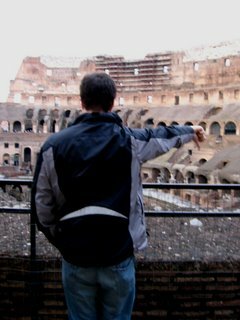 So we'll deal with the Colosseum in full right now, breaking a little bit with the chronological structure of the overall piece. But, in the future, AND ON THE INTERNET, we have the privilege of writing whatever we want! However we want! Day One brought us down the road toward the Colosseum, a building "much smaller than Gillette Stadium," according to Joe. 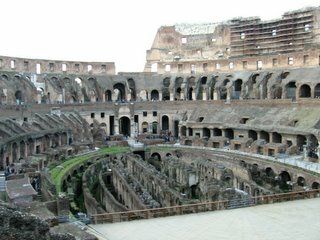 The Romans, having opted not for steel but for the far superior system of stacking bricks, only created a bowl that could, at peak 1900 years ago, seat 50,000 people. The gates closed at 3:30, pre-empting our visit by 15 minutes. So, fearing we may not be able to make our way inside at all (unsure of the depth of exploration that Day Two would bring), we attacked the problem the only way we knew how: pictorally! 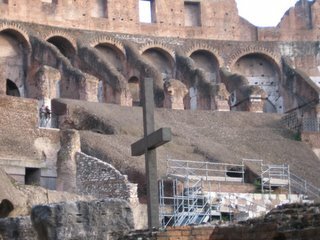 But, after hanging out at the Pope's digs on Day Two, we took the Metro (a system in which large steel boxes carrying gallons of graffiti on their exterior carry people with gallons of sweat attached -- and later unattached -- to themselves). Riding the train is not unlike living inside a carpet after a dog pees on it. But it got us there, and we made it inside at 3.15. You hear stories. You read books. You look at pictures in those books and on the internet in the future. 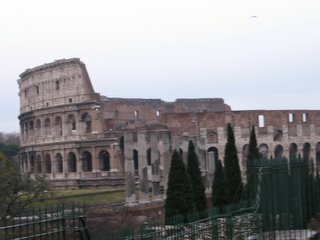 But you never really understand the enormity of the place where Russell Crowe made a name for himself before you sit inside. 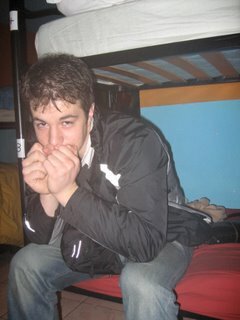 And really sit, really kick back and let tourists from Dallas tell you to watch out for pickpockets. And point to the spot where the emperor would stand and give the thumbs-up or thumbs-down after drinking delicious wine (which was very cheap, as we will deal with later). And look as the sun meanders through the arches, breaking apart as it nears an edge and shattering into diagonal and radiating and true rays that hug every edge and lance along every line. And remember that 1900 years ago, somebody may have been sitting in the same spot, admiring the craftwork of a lion as it eats someone's head. Though a quick drop-in at a pasticeria allowed for ample whimsy and caffeine and, after we took this picture, some Italians who made fun of us in Italian -- even though one of them did not comprehend the irony of the fact that he was wearing a "Boston" sweatshirt. He had not been there, we found out, upon inquisition. 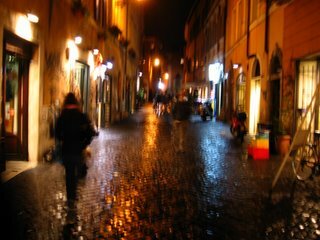 So Emily (who had spent time in Rome with her family over the summer) recommended Trastavere, this neighborhood on the opposite bank of the Tiber and very much out of the Roman crowd. But perfect, oh man. The cobblestone streets seem to barely squeeze between buildings, and even of the larger ones, rarely does one appear worthy of hosting any vehicle that runs on wheels, including baby carriages. But Piaggios (the Italian Vespas...you don't see the brandname "Vespa" ever, even though the scooters line the streets) zip through them, as do buses. Without warning, too. 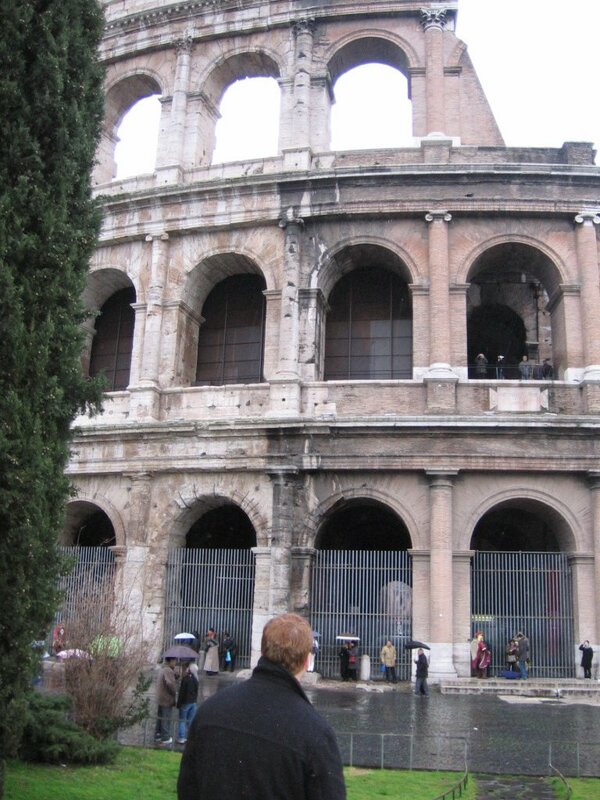 People scatter like gazelle when the lion comes, after it's eaten someone's head at the Colosseum. They should film car chase movies here. Bad camera work = impressionism. 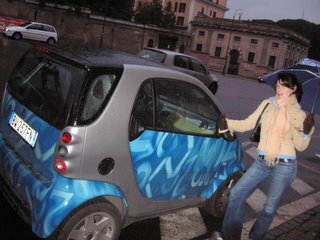 Emily loves those who drive SmartCars because she fancies some good ol' fashioned pragmatism. 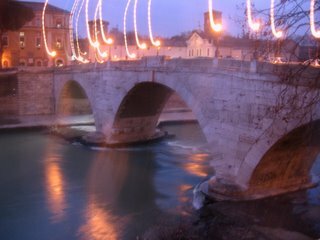 The bridge that spanned the Tiber and brought us to Trastavere. 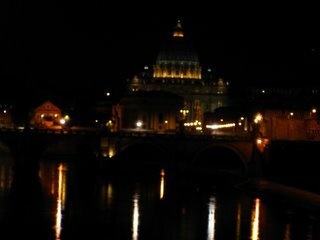 At 7 at night, the Tiber appears a sort of bright green, like a heavily-chemicaled fountain. I'm not sure if this color means it's healthier or less so than the Charles. 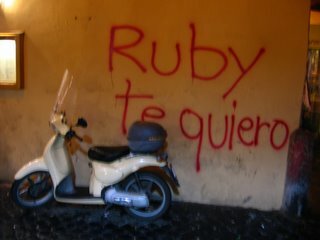 The Vespa's name may have been Ruby. That would be best, I think. A basilica which we had thought was St. Peter's, but turned out according to our map not to be so. This meant we were a bit off of our original course. 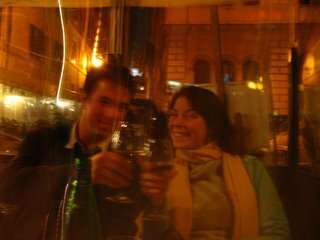 Joe and I celebrated more wandering with two 66cl (double-sized) Peronis bought from a street vender (everyone wants to sell everything they can in Rome). 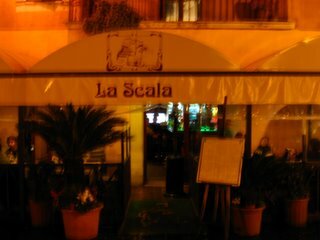 Upon later conversation, the beers were probably non-alcoholic. But delicious. After dinner, though, almost everything in life was gravy. Delicious, wine-and-garlic enriched gravy. In most likely the best meal I've ever purchased in Italy and the surrounding world, our foursome revelled in the very advantageous exchange rate. After multiplying all purchases in the UK by two (we round slightly up) to get the US cost for three weeks, we took the liberty of lopping off the .2 in the 1.2 Dollar-Euro exchange. It carried us through appetizers (bruschetta, prosciutto/mozzarella, tomato/mozzarella), main courses (pasta with flavors formerly unprovoked in my palette), dessert (apple cake) and two bottles of white, whose lovely taste and effects were enhanced by money saved by having been made in Italy. A really fortunate time for extended exposure. So we strutted out into the night, full of contentment and carbohydrates and rather dripping with a very electric ebullience and the rain that fell lightly. The walk back to the hostel took about 2-3 hours as we wound past things like THE PANTHEON and various fountains and obelisks. It seems that, for a time, as long as you died after the age of 30 in Rome, you could get at least a 20-foot obelisk out of the deal. Finally, after walking next to the train station where birds sat on top of trees in numbers that exceeded hundreds and hummed in high pitches while they peered down at men (and occasionally fired their poop at passersby), we made it back to the hostel. The bed was encased in dew and so was the floor and when we woke up for Day Two, our clothes were more moist than they'd been when we got back. But no matter. 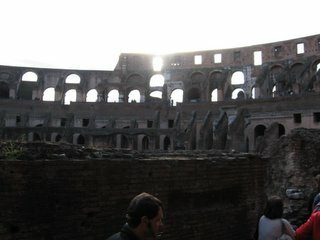 We had some Vatican-ing to do in the morning.